"When not close enough to be killed, the atomic bomb is one of the most beautiful sights in the world." Stars: Various members of the U.S. government and military. Having lived my entire life in New Mexico, I've experienced, to a certain degree, what it's like to be surrounded by "atomic age" culture, at least on a subconscious level. The city of Los Alamos was the result of the Manhattan Project, which gave birth to the atomic bombs dropped on Japan, and to this day holds Sandia National Labs which, as I write, is a place busy with all sorts of secretive things "for national defense." I live only a few minutes from the Air Force base that houses the National Atomic Museum, and there are few major landmarks here that aren't, in some way, touched by either the atomic age or the military in general. It's an odd mixture of elements, because many things going on around here are about discovery and exploration; a good part of the space program came from this area. But there's the destructive dark side of possessing amazing amounts of power that emerges as weapons development as well. In some small and subtle ways, it's like the Cold War is still in the air, hidden just under the surface. For better or worse, however, the experimental military projects of the late 1940s that went on in New Mexico changed the course of history. The Atomic Cafe is a film that tries to encapsulate the classic atomic era by going straight to the source: the original films, commercials and other propaganda, as well as the general hysteria that emerged during that time right in the heart of America. There are no interviews, no editorial views, and no postscripts. This is the United States of America, raw and uncut from the birth of the atom bomb to the height of the Cold War, and it's not pretty. Of course, I believe that's the point. 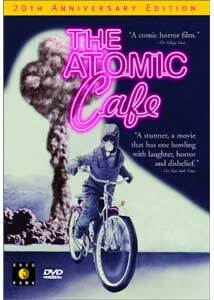 Although parts of Atomic Cafe are funny, almost tragically so, overall, it is a compilation of footage that's more disturbing and horrifying than anything else. It is a collaged artwork of darkness that doesn't have to reach far or exert much effort to make its points, and ultimately those points expose the dark side of American history. As I said, much of the film is funny in a strange way; for example, there is a filmstrip during which a man demonstrates how his little son can safely ride his bike during an apocalypse, so long as he wears a ridiculously cumbersome radiation suit. The quality of the commercial and educational films convincing people that atomic bombs are not insurmountably dangerous (except to people like Communists) is amazingly poor, making the humor even funnier. With this laugh at the expense of history, though, comes the scary stuff, like the McCarthy/Nixon Committee On Un-American Activities to the shocking behind-the-scenes footage of American soldiers on training maneuvers during an atom bomb blast who were lied to about the dangers of radiation. A few laughs will undoubtedly come out of this chilling segment of the film, though, when one sees the pathetic training films from such missions. It amazes me that the whole world wasn't destroyed during an era of such paranoia and fanatical hatred of all things "Un-American", and The Atomic Cafe is evidence of how that destruction almost happened. Image Transfer Review: As most of the footage here is from stock dating to the 1940s, '50s, and '60s, the quality is obviously low and all over the map. Some segments are extremely poor, but nothing so bad it can't be watched. Docurama did its best with this material, but noticeable pixelization and compression artifacts do crop up. These really aren't flaws, though, and the overall quality is precisely what you'd expect from a transfer with such questionable source material. Audio Transfer Review: The audio is, like the footage, a bit worse for the wear but functional. For the most part, you're looking at mono dialogue and music given the age of the material. Otherwise, there are no complaints or issues. Extras Review: There are no additional features on the disc, save the basic menus and chapter selection. Atomic Cafe is just as relevant today as when it was first released, perhaps more so than most might think. It's also a fantastic collage-style documentary, ranking with some of the finer examples of the genre, like The Ad and the Ego and Feed (which also featured the involvement of Kevin Rafferty). It is a must-see for virtually everyone and, in my opinion, should be required viewing in schools.